The first official day back of the 2007-2008 school year found teachers at Otay Elementary School sharing summer adventures and expectations for the upcoming year. The principal opened the first staff meeting by revisiting the welcome back letter each staff member had received earlier in the summer. The collective efforts of all teachers, support staff, students, parents and community members had resulted in the accomplishment of some highly set goals. The principal smiled as he announced the school had officially exited Program Improvement Status. The school year was off to a fantastic start. Otay Elementary School is one of 44 schools in the Chula Vista Elementary School District, a K-6 district located in San Diego County, California. Its 600 students include 90% Latino students, 71% English Language learner students, and 61% that are eligible for free or reduced lunch. It is located in one of the southernmost sections of San Diego County, mere minutes from the California-Mexico border. The story of Otay Elementary School demonstrates that coherence around a framework, a commitment to data analysis, and strong collaborative leadership can result in an increase in student achievement results for schools challenged with high percentages of English Language learners. A study done by the Chicago Annenberg Research Project (2001) asserts that schools whose improvement efforts show strong coherence around a framework or instructional program are more likely to advance and demonstrate increases in student achievement. Effective schools research supports this premise. The Chicago study identifies three major conditions that are in evidence in schools with strong instructional coherence. The first condition is that there is a common instructional framework guiding the teaching, assessment, curriculum, and school climate for learning; the second is that the staff is supported in the implementation of the framework, and the third is that the school allocates resources to sustain and advance the implementation of the framework. The framework is used as a lens to target the efforts of staff and resources, as well as to avoid scattered improvement efforts. Otay Elementary School has embraced the implementation of the Targeted Leadership Framework for Achieving Powerful Results which meets all the conditions identified in the Chicago study. The framework includes six elements that drive the decision making at the school. The six elements are as follows: develop an instructional leadership team, identify and target an area of instruction to improve teacher practice and student learning, examine data and student work, build instruction expertise through a targeted professional learning plan, align resources to support that plan, and partner with families and community to sustain learning for all students. One key element in the TLC framework is the need for schools to establish and train a team of staff members to lead instructional improvement efforts in their building With training and support from TLC coaches, Otay Elementary has an instructional leadership team that is comprised of the principal, instructional coaches, special education representative, and a representative from each grade level. This instruction leadership team (ILT) meets regularly to plan the agendas for grade level collaboration, to staff professional learning, and to lead meetings around teaching and learning. Their primary function is to build a culture of collaboration to sustain instructional improvement. Over the years, membership has rotated among different staff in order to build capacity and demonstrate a commitment to shared leadership. An initial task of the ILT was to lead the staff in an analysis of data to identify an area of the instructional program that needed concentrated effort. The staff identified writing as an area of need. The school currently participates in the Reading First Initiative, so there is a school-wide implementation of a state-adopted text for language arts. Having a common text being used school-wide provided a common starting point to examine what practices were being implemented and which were most effective. Again, with ILT leadership, the staff came to consensus on the practices that would be used school-wide and what they would look like by grade level. Scaffolding for the English Learners was a key conversation in this phase. The targeted focus around writing provides the lens for the majority of professional learning for the staff. Using the lens of writing as the center point for professional learning means there is common language, expectations and implementation of practices that provides coherence for the work done throughout the school. In addition, parent educational meetings target this area. Walking the building at Otay, one can see abundant evidence that teaching and learning are what this school is all about, with an emphasis on the teaching of writing. Ask students, parents, teachers or any other staff and they will all respond that writing is their targeted area. As cited in the Doug Reeves 90/90/90 study (2004), there are characteristics common to schools that are high achieving. These schools stress the importance of student achievement with an emphasis on improvement. Data is evident throughout the buildings of these schools and improvement is measured on a regular basis. Even more significant is that attention is targeted around a few indicators, as opposed to a large number of unfocused areas of need. 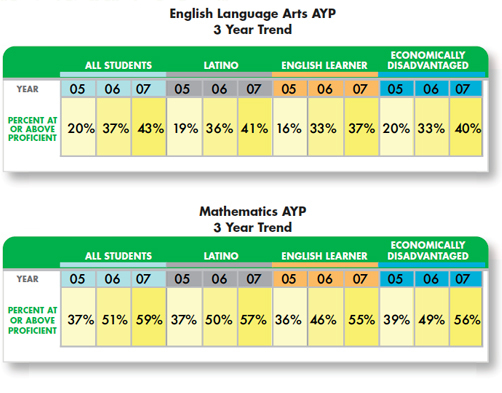 Like those high achieving 90/90/90 schools, the staff and community at Otay place great emphasis on data analysis. Data analysis is at the core of all decisions made about and for students. Programmatic decisions, as well as the setting of school, grade level and individual student goals, are all grounded in the data analysis. The principal begins each school year with an analysis of the data from the previous year’s state test results. In addition, four to five monthly staff meetings are also dedicated to whole staff analysis of data. This activity provides time for conversations between grade levels to maintain a sense of whole school improvement. Like many other schools working with TLC, Otay Elementary has a structure and process for using the analysis of implementation and student performance data results. The week before school starts, each grade level sorts their incoming students by California State Standard proficiency level and standard score. This sorting provides the classroom teacher with a quick reference of how well the students performed in the English Language Arts and Mathematics components of the assessment. The results of the Houghton-Mifflin theme tests, given every six to eight weeks, are used to form guided reading groups and identify strands with which students struggle. Between theme test administration, student work is analyzed to measure the impact of instruction, monitor for possible gaps in learning, and to provide more immediate opportunities to intervene. This consistent analysis of data (state test results, benchmark results, student work analysis) provides a structure for monitoring student growth in a systematic manner. In addition, the monitoring of students individually is also of great importance at Otay. In the principal’s office, charts with names and faces of students in grades 4-6 who have been at Otay consistently since kindergarten and have had multiple years scoring at the Basic proficiency level or below are posted. Underneath each student’s profile is a teacher’s name. These teachers are committed to assisting these students by making personal connections and being their personal advocate for success. This truly brings the data to life. There is a wealth of studies citing the importance and value of collaboration among teachers. Times of highly visible accountability and the difficulty of retaining teachers beyond their first five years of service dictate that support needs to be targeted around building teams and providing dedicated time for collaboration. The implementation of professional learning communities throughout the nation speaks to this recognized need for teachers to have structured opportunities to dialogue about their craft. Part of the training that TLC provides involves examining ways teachers in a school can create time for collaborative planning. After examining different scenerios and tools for collaboration, Otay allocated resources to provide dedicated time for teachers to collaborate on a regular basis during their school day. A clear message prior to the implementation of this dedicated time was that there would be an agenda focused around data and the analysis of student work that would support the planning and implementation of practices back in the classroom. This collaboration occurs twice monthly for a three-hour period. During the time teachers are meeting, students are with support teachers who provide instruction in areas such as art, technology, science and extended math support. The Instructional Leadership Team (ILT) establishes agenda items that will be common to all grade levels in addition to allocating time for grade level specific agenda items. An example of a common agenda item for all grade levels is the examination of student work. It is during this time that the ILT member facilitates discussions around the analysis of student writing samples. Teachers identify patterns and trends of student achievement and identify instructional practices that will be implemented to support student growth. 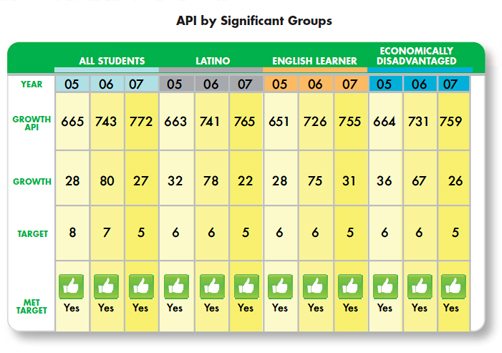 Practices to support English Learners are also targeted at this time. In addition to the examination of student work, results of theme tests given every six to eight weeks are also analyzed. The instructional coaches are a part of these collaboration meetings. Sometimes, teacher teams may use the collaboration time to observe one of their colleagues teaching; they may do a walkthrough of their grade level classrooms to see how room environment supports the instruction of writing; they may walk the rooms of the grade level above them to see what students are doing in order to calibrate for rigor; or they may go to another school that has a similar targeted instructional area to see what the other school is doing. Regardless of the activity, the agenda revolves around teaching and learning, with an emphasis around writing. Monthly staff meetings provide opportunities for vertical articulation where teams of teachers, kindergarten through sixth grade, have a chance to share what is happening at their grade level. Activities at staff meetings to support the area of writing have included the discussion of student work and establishing what proficient means, and how it looks school-wide. Sometimes it may be the discussion of a practice that is being done school-wide and the sharing of how it might look in first grade as opposed to fifth grade. Successful collaboration means using structures for effective team meetings, such as roles of facilitator, timekeeper, recorder, process observer. It also means the use of protocols that provide structures to make it safe to ask challenging questions of each other and make effective use of time. This year in particular, Otay has received external recognition for their work. They are the recipient of the California Association of Bilingual Educators “Seal of Excellence” for 2008. In early January, California’s Gov. Schwarzenegger and United States Secretary of Education Margaret Spellings visited to see what practices teachers were using to gain such success for students. Otay is also a candidate to receive the California Distinguished Schools award for 2008. Even with all of this recognition, the staff knows their work is not done. They continue to examine and grow and learn. Their work around the three C’s of coherence, commitment, and collaboration ensures that they will continue to have success for the students that come to Otay every day. Amalia Cudeiro, Ed.D and Jeff Nelsen, Ph.D are co-founders and partners with Targeted Leadership Consulting. Both have served as teachers, principals, and central office administrators and have provided training and coaching to more than 2,000 principals and school leadership teams over the past decade, helping schools and districts set and meet rigorous, measurable student learning goals.